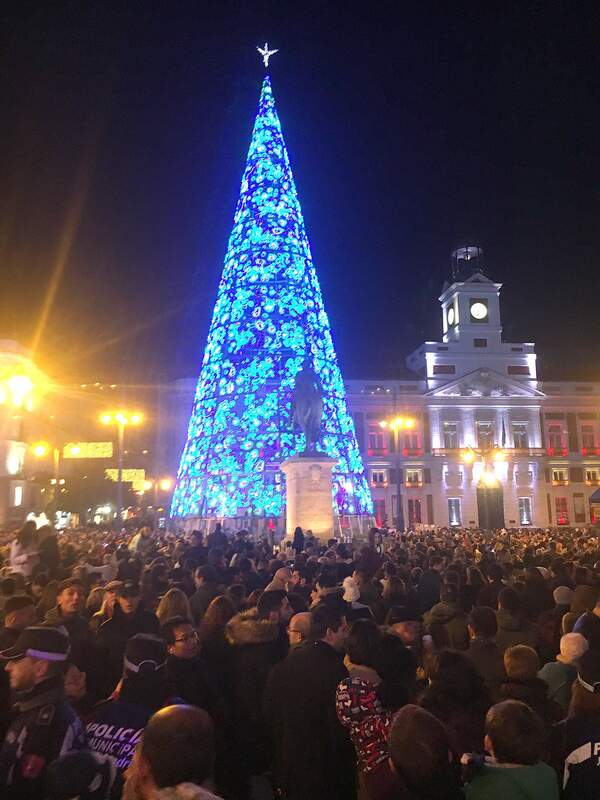 The spectacle of towering metallic lighted trees in and around Madrid’s Puerta del Sol square really is magical. Walking the main drags requires a snail’s pace, as you are shoulder to shoulder with your neighbor. The Feast of the Immaculate Conception draws Spaniards from the around the country to kick off the holiday season. 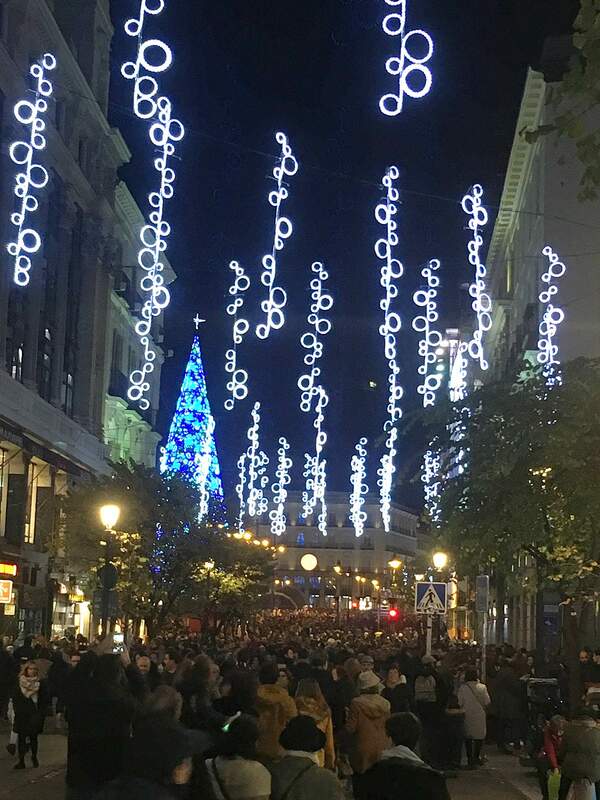 Like others in Spain, our family headed to Madrid over the Feast of the Immaculate Conception holiday. 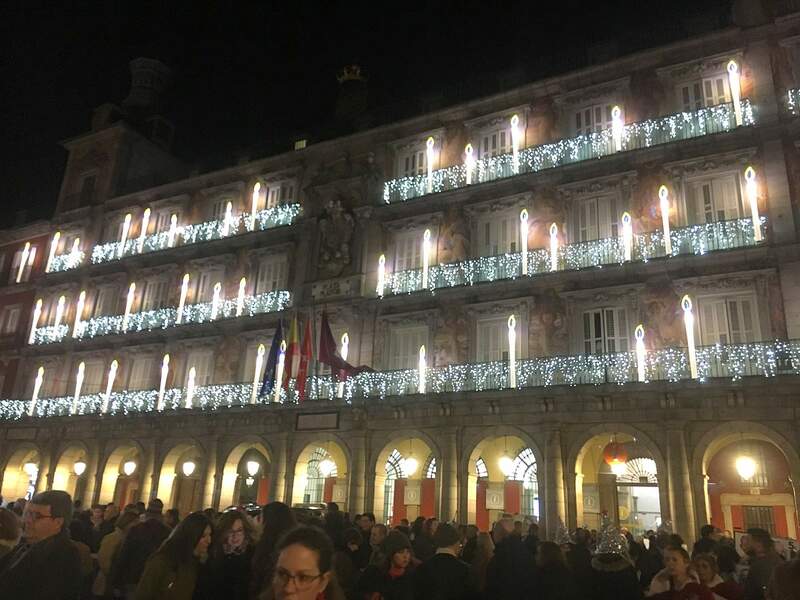 I learned quickly that the Feast of the Immaculate Conception is a big deal in Spain. It is the day the Roman Catholics (meaning almost all Spaniards) celebrate the immaculate conception of the Virgin Mary. In non-religious terms, it is also the day that kicks off the Christmas season, so people are ready to get out and look at lights, go out to dinner and clubs and start their shopping. I became aware of how popular this holiday is when I tried to extend our Madrid stay and every single hotel in Madrid was booked. That’s a lot of hotel rooms. The old town is a vibrant and bustling place, so historic buildings are not necessarily preserved in their original capacity just for tourists but used for something new as well, so a walking tour was helpful to learn some of the hidden history of the city. The tour guides offered one tour in English and three in Spanish. In other towns we have visited, there were also tours in German, French, Italian and more. 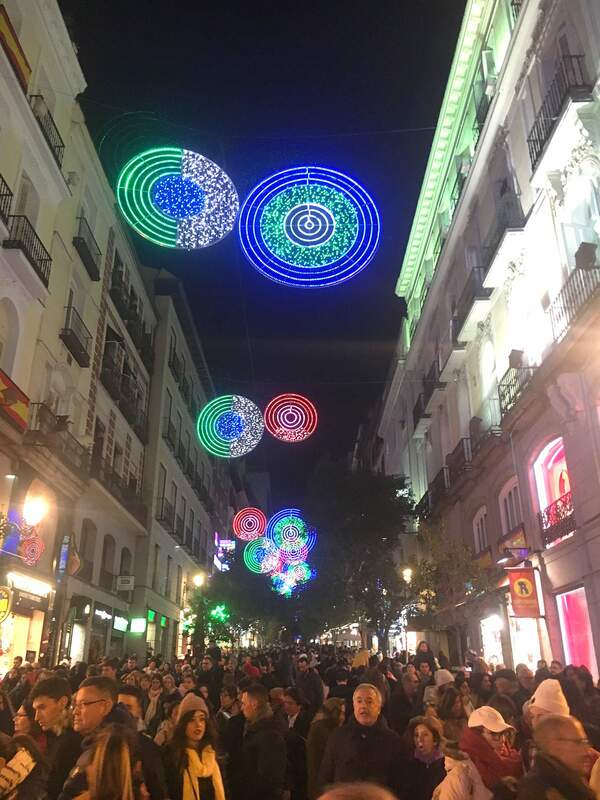 The guides told us that for the Feast of the Immaculate Conception holiday, they didn’t do many tours in any language but Spanish because Madrid is filled mostly with Spanish tourists. It’s the primary destination for people from Spain to see Christmas lights. The tour allowed us to see some of Ernest Hemingway’s old haunts, learn how to spot businesses that have been open since the 1800s as well as grab a calamari bocadilla from a small shop that is a local favorite for Madridians. This was obvious because of the line that wrapped around Plaza Mayor. We also learned some interesting tidbits, such as the sign of a good bar being that people throw lots of napkins on the floor. Tourists think these bars are dirty, but locals look for floor detritus. The Grand Via, Calle Mayor and Calle del Arenal are the main walking drags, the latter two being blocked to traffic. Walking them requires a snail’s pace, as you are shoulder to shoulder with your neighbor. Everyone moves as one organism, and younger children are literally buried by the crowds. I ended our walk at night earlier than my husband and son because our 8 year old was uncomfortable not being able to see beyond the people. Other than the experience of doing it, you may ask why anyone would even try to join with the throngs. Other than the chance to say you’ve done it, I would say it’s because of the lights. 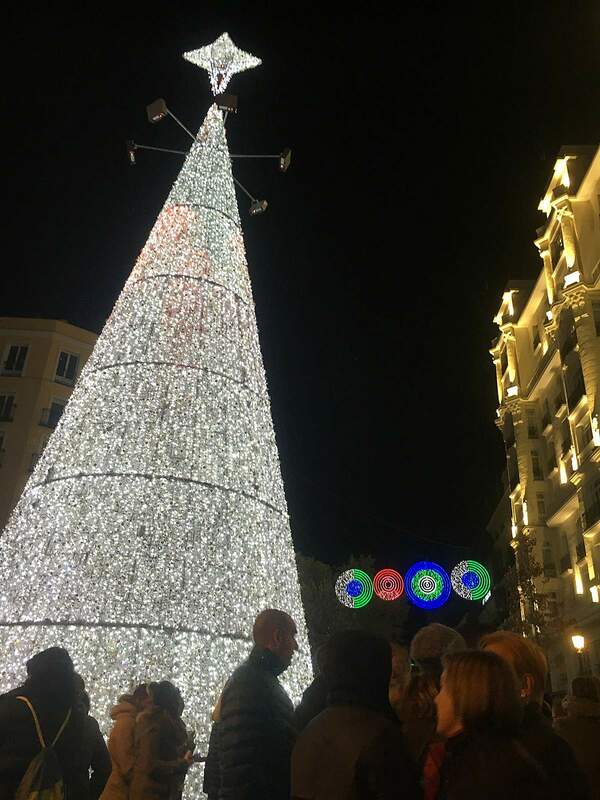 The spectacle of towering metallic lighted trees in the squares, giant moving polar bear panoramas, different light themes hanging from every block and lighted images shining on all of the buildings really is magical, especially when you are gazing at palaces and ancient architecture in the background. So much so that it’s hard not to just stand with your mouth open looking up. Now that I think about it, you don’t even need to walk, but just stand still for a while in awe of the sheer energy and lights that make Madrid such a destination for tourists and Spaniards alike. Sally Shuffield is a Durango resident living in Spain for a year with her family. Follow her blog at www.sallyshuffield.net/spain-blog.